Vermeer has announced the compact D10x15 S3 Navigator horizontal directional drill (HDD) for the utility installation market. The D10x15 S3 is designed to provide more power and carriage speed, and lower sound levels than its D9x13 S3 Navigator HDD predecessor. The D10x15 S3 features a 60 hp (44.7 kW) Deutz TD2.9 Tier 4 Final engine — a 36 percent power boost compared to its D9x13 S3 predecessor. Vermeer also increased the thrust/pullback to 10,000 pounds (44.5 kN), the maximum torque to 1,500 foot-pounds (2,033.7 Nm), and the maximum spindle speed to 220 rpm. Speed, sound and simplicity are trademarks of the entire Vermeer S3 drill lineup. With those goals in mind, Vermeer increased the maximum carriage speed to 208 fpm (63.4 m/min), and reduced operating noise. The drill’s reduced sound levels help reduce noise and disturbance on residential jobsites, and enables easier communication among the crew members. The combination of the drill’s reduced sound levels and compact size, and the drill rod’s tight bend radius, makes it well suited for short “curb-to-home” fiber and service work. These shots are typically less than 300 feet (91.4 m) and 4 inches (10.2 cm) in diameter. Like other models in the Vermeer S3 product line, the D10x15 S3 has an optional DigiTrak Aurora interactive, full-color touch-screen display. The Aurora screen delivers real-time, easy-to-view location information, and can be used in conjunction with the Vermeer Productivity Tools. The D10x15 is the latest addition to the Vermeer S3 Navigator HDD product line, which includes the: D20x22 S3 Navigator HDD, D23x30 S3 Navigator HDD, D24x40 S3 Navigator HDD, D40x55 S3 Navigator HDD and D60x90 S3 Navigator HDD for utility work, and the larger D100x140 S3 Navigator HDD and D220x300 S3 Navigator HDD for pipeline installation projects. The D10x15 S3 features a 60 hp (44.7 kW) Deutz TD2.9 Tier 4 Final engine. The D10x15 S3 is designed to provide more power and carriage speed, and lower sound levels. D10x15 S3 has an optional DigiTrak Aurora interactive, full-color touch-screen display it delivers real-time, easy-to-view location information, and can be used in conjunction with the Vermeer Productivity Tools. More than 50 percent of reported underground utility damages are the result of insufficient excavation practices according to the 2017 DIRT Report. The Ditch Witch organization, a Charles Machine Works Company, has introduced an industry-first Virtual Reality (VR) Simulator to better prepare horizontal directional drill (HDD) operators for safe underground construction through cutting-edge training technology. The Ditch Witch organization, a Charles Machine Works Company, has updated its line of fluid management systems to increase productivity and reduce costs on horizontal directional drilling (HDD) jobsites. These advanced models incorporate new design features to meet the highest standards for jobsite productivity, improved drilling fluid flow, increased durability, and faster mixing cycles and yield times. The DD-240T Midi Rig introduced a whole new design concept in horizontal directional drills when it was launched late last year. Technical Toolboxes, a global provider of integrated and cloud-based pipeline software, consulting and industry training for pipeline engineering and technical professionals, has launched its new Horizontal Directional Drilling PowerTool (HDDPT). Sandvik has acquired privately-owned Inrock, a supplier of rock drilling tools and services for Horizontal Directional Drilling (HDD) in North America. Headquartered in Houston, TX, Inrock is a market leader in pilot hole bits, reamers, guidance systems, accessories and services for the premium maxi rig segment within HDD. MTI Equipment, a Charles Machine Works Company, recently completed construction of their new facility in North Port, Florida. Moving from their longtime location in Englewood, company officials say the new facility carries a larger inventory, offers improved service capabilities and is more conveniently located for customers. HammerHead Trenchless, a Charles Machine Works company, has promoted three of its top personnel to newly created management positions. HammerHead President Kevin Smith said the new positions are part of an internal expansion initiative that strengthens the company's existing focus on customers and users. Designed and tested with the help of small bore contractors, the Radius HDD Over-Bit Reamer easily attaches to an existing rock bit without breaking a single connection. The Radius Over-Bit Reamer only needs 16 inches of clearance. With the pilot tool still attached, the sonde can be used to track progress through tight easements during pullback. The Radius Over-Bit Reamer is available in 6- and 8-inch sizes with a variety of cutting styles. 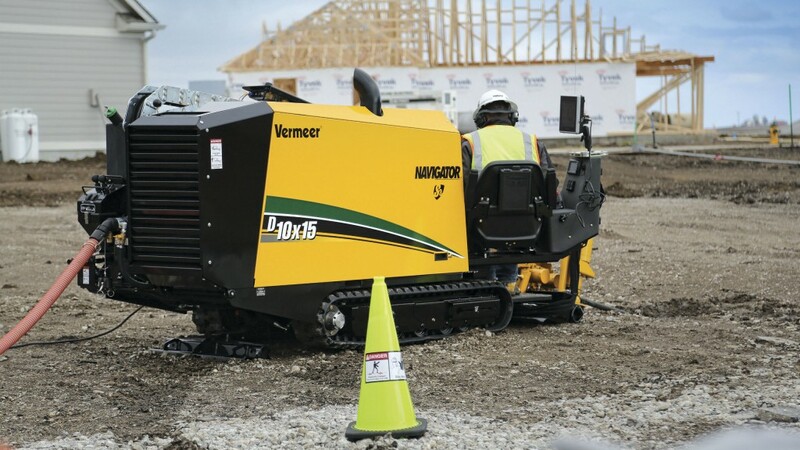 Two of the horizontal directional drilling (HDD) industry's leading equipment and tooling manufacturers, Vermeer Corporation and Mincon Group PLC, have formed a distribution alliance to expand contractors' access to quality rock tooling worldwide. As part of the agreement, Vermeer dealers are now the exclusive channel for Mincon HDD air hammer systems, HDD pull reaming hammers and HDD support equipment, including HDD support stations and oilers. Vermeer expands its line of utility installation equipment with the launch of the D8x12 Navigator horizontal directional drill. This new compact and highly productive drill is sized for working in tight spaces, features straightforward controls and delivers quiet operation. With two drill rod options for added versatility, the Vermeer D8x12 is well suited for small service installations, including gas distribution, power, water and telecommunication networks. The Ditch Witch organization, a Charles Machine Works Company, has released an advanced version of their industry-first, web-based tool that helps customers be more efficient and reduce downtime by quickly finding the service parts they need. The Ditch Witch Parts Lookup gives customers easy access to detailed parts information and a direct line of communication to dealerships for part verification and pick-list creation. StraightLine HDD announced the addition of multiple pipe sizes to its growing offering of in-stock drill pipe. The product expansion more than doubles the number of available Vermeer-compatible pipe and adds three common Ditch Witch-compatible pipe sizes. TT Technologies' redesigned Grundopit pit-launched mini directional drill is well suited for difficult fiber-to-the-home and utility service line installations in tight working conditions. The unit is compact, 54 inches long, 43 inches wide and 57 inches tall. The Grundopit delivers 13,489 lbs. of thrust and pull back and 553 ft. lbs. of torque with bore length up to 150 feet. The Grundopit is an ideal entry-level system for utilities, cable industries or as a supplement to larger units. Utility and underground contractors have a new solution to save time and streamline operations with the introduction of the innovative Toro DD2226 directional drill. Pipeline and utility contractors attending the 2017 International Utility and Construction Equipment Exposition (ICUEE) in Louisville, Kentucky, were first to see the newly released American Augers M-300D HDD fluid cleaning system. Based on American Augers' successful, highly portable M-200 platform, the M-300 system's small trailer size lowers registration and excise tax requirements while supporting any make of 60- to 100-ton drill unit with a true 300 gpm fluid-cleaning capability. HammerHead Trenchless, a Charles Machine Works company, introduced its new 22-ton, radio remote-controlled HydroGuide® HG2200 cable winch at the 2017 International Construction and Utility Equipment Exposition (ICUEE) in Louisville, Kentucky. The HG2200 completes the HammerHead line of next-generation winches designed for maximum efficiency and ease-of-use in pipe-bursting, slip-lining and pipe-slitting applications. To enhance utility contractors' efficiency while drilling and steering in hard rock, Ditch Witch, a Charles Machine Works Company, has released the new AT40 All Terrain horizontal directional drill (HDD). The machine features an advanced, two-pipe All Terrain drilling system that provides 33 percent more torque than competitive units. The newly optimized All Terrain drilling system includes multiple patent-pending designs that improve downhole operation. An inner-rod design provides a flush system that improves tool-joint durability and steering in hard rock conditions. To further improve steering and optimize fluid flow, a reliable All Terrain connection reduces the risk of collar damage. The Ditch Witch organization, a Charles Machine Works company, is planning to unveil a wide variety of new and enhanced underground construction equipment, parts, tools, and technology—all designed to boost productivity at the International Construction and Utility Equipment Exposition (ICUEE) Oct. 3-5 in Louisville, Kentucky. The spring 2017 acquisition of Armadrillco solidified StraightLine HDD's position as a leader in hard condition tooling. The announcement today of the adaption of the patented Armadrillco transmitter housing to the RockEye Hammer System is a significant step in diffusing Armadrillco technology throughout StraightLine HDD tooling platforms. StraightLine HDD recently expanded its hole opener offering with the introduction of the XL-I Series. Designed from the ground up for horizontal directional drilling, the XL-I Series is positioned as a cost-effective alternative to "split-bit" hole openers. Success in the HDD business is about more than boring a stable hole and completing a successful pullback. It's about running your entire HDD operation like a well-oiled machine. Here are five ways we've seen successful HDD companies make businesses function more smoothly and create lasting success, followed by an example of what to look for in on specific type of tool, the backreamer. Ditch Witch has introduced the new Rock MonsterHD backreamers to help today's horizontal directional drilling (HDD) operators improve drilling performance in hard rock conditions. Utilities and underground industry contractors have a new tool to increase productivity with the launch of Toro’s new directional drill operating system, TDOS-1 with SmartTouch. The new system allows pipe handling functions to be performed using a single input on the joystick in SmartTouch operating mode. StraightLine HDD, Inc. announced the implementation of an upgrade to its popular Performix Mud Mix System. At the heart of the Performix System is the centrifugal pump, which generates the best laminar flow in the industry. The performance pump now features an upgraded silicon-carbide shaft seal. Compared to traditional ceramic seals, the new seal represents a considerable advancement in resiliency when subjected to the highly abrasive elements present in mud mixing. In field testing, silicon carbide seals improve service life by a factor of three,over ceramic seals. Vermeer has bolstered its line of HDD tooling and accessories with the addition of the Silver Series drill rod. Building on the tradition of it's acclaimed Firestick drill rod, Silver Series drill rod gives contractors a quality aftermarket drill rod at an economic price. To equip utility contractors with the latest technology for optimal drilling productivity, Ditch Witch, a Charles Machine Works Company, has added the innovative new JT40 horizontal directional drill (HDD) to its fleet of drills. Pipeline crossing in a single step. In the fall of 2016, drilling contractor PPI Chrobok S.A. installed two new gas pipelines in Poland. The alignment runs along existing gas lines and through geologically challenging terrain. With the laying of the 700 and 464-meter-long pipelines, Herrenknecht's Direct Pipe technology was used in Poland for the first time. Ditch Witch has introduced the JT10 horizontal directional drill (HDD) providing operators with exceptional power in a compact, reliable platform. For superior productivity, the machine incorporates advanced features found on larger units while remaining the most compact drill in its class. Today’s horizontal directional drilling (HDD) operators face plenty of challenges on large installation projects, including difficult terrain and tough soil conditions. To provide operators with the power and performance to conquer any job, Ditch Witch has introduced Tier 4 emission standard upgrades to the JT60 and JT60 All Terrain directional drills. For operators who need the power to drill through the toughest conditions, including solid rock, Ditch Witch has upgraded the JT100 and JT100 All Terrain horizontal directional drills (HDD) to Tier 4 emission standards. Ditch Witch, a Charles Machine Works Company, has introduced the Air Saber lance, a new excavation accessory for the company’s FXT air-excavator equipment line. Ditch Witch, has introduced the new Prospector Nozzle for better productivity on hydroexcavation jobs. Operating at 3,000 psi, the nozzle helps operators conquer the toughest challenges while boosting performance by 30 percent compared to similar nozzles on the market today. Equipment maintenance is a topic that no contractor particularly wants to address, but in light of the ever growing need to maximize production and cut down time it is extremely important. Your equipment will only continue to work properly if you take the time to perform simple routine maintenance. They are two words no contractor or municipal engineer wants to hear: cross bore. A cross bore is what happens when one underground utility intersects another. Most worrying is when a gas line punches through a sewer main or lateral. Cross bore risk has risen with the use of trenchless technologies like horizontal directional drilling, because the operator can’t physically see what’s in the immediate vicinity of the drill bit. The KEMTRON 200HD2 fluid recycling and mixing unit was designed to provide an economical alternative to traditional fluid mixing and vacuum trucks. Ditch Witch, has announced a replacement program for Ditch Witch Power Pipe HD. Subsite Electronics, a Charles Machine Works Company, has introduced a new series of versatile, money-saving HDD Beacons: the 15T, 17T and 19T. Available in one, three or four frequencies, these beacons feature three field-configurable power levels and automatic tuning circuitry that adjusts to match the housing the operator is using. In just three months Australian drilling contractor Dunstans Construction Group installed a 700-meter-long pipeline in Anglesea (Victoria). A 250 tonne HDD Rig from Herrenknecht played a key role in the achievement. Within a very short time the construction crew built a sea outfall with the machine, as well as pulling in the pipeline all the way back to the local water treatment plant. The introduction of polycrystalline diamond composites (PDC) to Hard Metals’ Wombat line of hole openers and reamers can be traced back to the Australian company’s first forays into trenchless technology in 2007.